The Trojan War is a colorful, exciting and fast playing cardgame for 2 players in the times chanted by Homer. One player leads the Trojan army, the other the Achaean army. In a series of battles the players try to beat their opponent. Famous heroes of the Iliad are helping them achieving their aim. 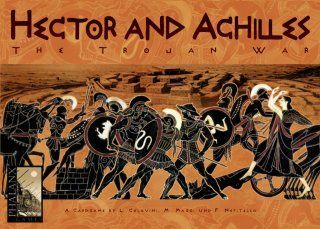 Hector and Achilles: includes 108 playing cards (96 army cards, 12 hero cards), 2 gameboards, 19 game pieces (6 divine favor markers, 6 shame markers, 6 fate tiles, 1 attacker marker), and 1 rules booklet.